She was right. I have been blessed. And so many people have helped. It has happened so many times in High Point. But it started in Mt. Olive. Before coming to High Point, I lived off campus at Mt. Olive College, and the housemother slipped into my bank account enough money for me to buy my first car – a used car. She told me she’d rather invest her money in a promising young man than park it somewhere in a bank. What an angel. In 1970, after graduating from High Point College, I remained in High Point and got involved in my city, raising my family and donating to and raising money for my alma mater and my city. In 1993, two years after High Point College became High Point University, the school elected me to its board of trustees, and 11 years later, my fellow board members asked a question that would change my future forever. Nido, they asked, will you lead HPU? I came from a varied background of business — consultant, author, speaker and entrepreneur. But I always felt I was an educator at heart, having turned my lectures and seminars into one big classroom. And, besides, I loved my alma mater, my city and the Triad. Plus, the possibilities were limitless — to build upon the past to help High Point University grow; to partner with talented faculty and loyal alumni, committed staff, and supportive parents; and to see its students excel. In January 2005, 10 years ago last month, HPU appointed me as its seventh president, and I saw my alma mater to be a God, family and country school that could emphasize the values and fundamentals that built America. No apologies for that. As a patriot to the core, I remember what this country and campus did for me — and what higher education needs to do for others in the 21st century. Students come to campus armed with iPhones loaded with apps, and they have gotten used to accessing anything in the world with a touch of their screen. Good for them — and us. But we must not confuse accessing information with obtaining knowledge. The two are not the same. We in higher education need to help students understand that leveraging the abundant information available at their fingertips is not a substitute for the patience of scholarship and experiential learning. An education must be holistic, impacting their mind, heart and soul. It must prepare them with an ample supply of vertical thinking — understanding not just the how, but the why to help them grow and mature. It must equip them with the knowledge, skill, and enough experience to make them valuable to potential employers. Couple that with an entrepreneurial spirit and an awareness of what built America in the first place, and I believe an education like this will set students apart and place them on a trajectory of achievement and stewardship. But students must understand the importance of building relationships and finding solutions in a life grounded by core values everyone holds dear — generosity, civility, curiosity and respect. Studies show college graduates will have dozens of jobs in their lifetimes, and they need to be flexible, develop leadership skills and not shy away from taking calculated risks. This kind of employment climate can be scary to many, particularly in an era where so many graduates seem to look the same — the same degree, the same knowledge, the same skill set. Today, more than ever, graduates have to compete not just with their strengths but with their differences to prepare for what the world is going to be. In our international economy, they are competing on a global platform, and to succeed, they must understand the importance of private enterprise and embrace a growth mindset that can help them adapt and recalculate on the fly. Their knowledge and skills may only be as relevant as the latest trending topic on Twitter. But their values can guide them through this changing world because the relevance of their values will never expire. At High Point University, in the seminars I teach for freshmen and seniors, we cover all kinds of topics from time management to fiscal literacy. Who you spend time with is who you become. Be a job creator, not a job taker. Stand for something or you will fall for anything. Change your words and change your world. They need to understand the importance of civic engagement and philanthropy, and like you and me, they need to know they are the byproducts of the beliefs we keep close. They need to believe they can be extraordinary. It is a choice. Our lives are full of turning points. I’ve seen that in my own life as well as so many of those on campus. 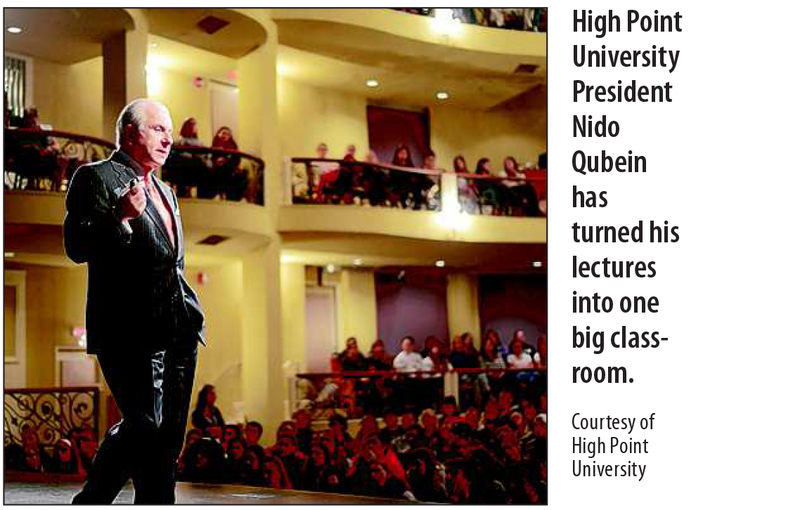 At High Point University, we believe in the art of the possible. Last fall, we broke ground on a $20 million building that will help students develop viable careers. And this year, we will break ground on a $87 million building that will help students become physician assistants, physical therapists and pharmacists – jobs that are growing in demand. With college affordability a major challenge for so many, institutions like ours have a responsibility to help liberal arts graduates achieve a life filled with success and framed with significance. We have to guide them toward becoming better communicators, better writers, better problem-solvers — and better vertical thinkers who also take Barclay’s mantra to heart. Our faculty and staff help them do just that. Our faculty and staff prepare young people for the world to come by planting seeds of greatness in their minds, hearts, and souls. Today, when I hear our students talk about life, purpose, passion and service, I see our future — and our country’s future. And it is bright. For me, there is no greater reward than that. So, after 10 years at HPU, I told a friend the other day I don’t even think about retirement. As much as we’ve accomplished, I feel like we’ve only just begun. Turning points lie ahead. The best is yet to be.